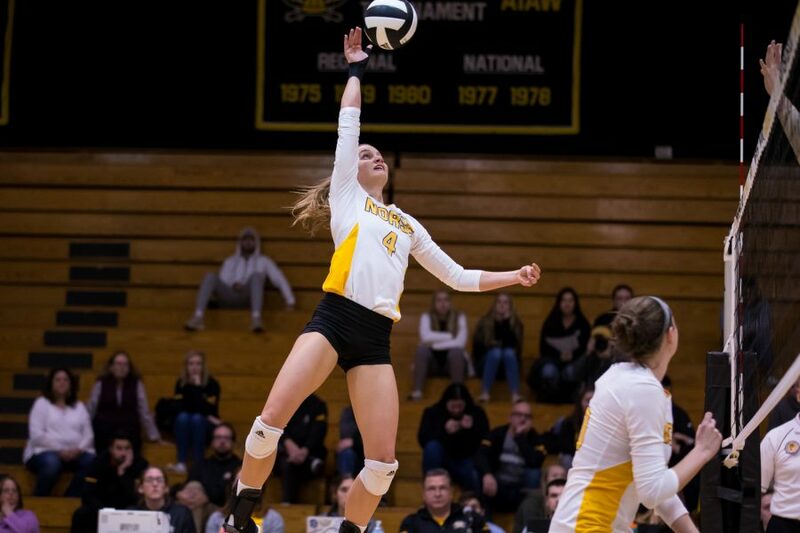 The NKU women’s volleyball team season ended in the first round of the National Invitational Volleyball Championship, after being swept by Miami (OH) in three sets (25-14, 25-18, 25-22) on Thursday night. With the loss, the Norse end their 2018 season with a winning record of 21-10. Laura Crawford and Natalie Hardig led the Norse offensenly with eight kills apiece, while freshman sensation Miranda Wucherer recorded her 16th double-double of the season with 12 assists and 11 digs. Sophomore libero Ashton Terrill led the Norse defensively with 22 digs. On her 16th dig, Terrill became the 21st Norse in program history to tally 1,000 digs in a career. She currently ranks 19th all-time after surpassing Molly Donovan (1995-98) and Jessica Buroker (1997-2000). Senior standout Haley Libs closed her final match as a Norse with seven kills and nine digs. Libs leaves behind a Hall-of-Fame career with 1,580 kills and 1,311 digs, ranking seventh all-time in both categories for the Norse. The RedHawks gained an early advantage to start the first set and extended it after a Norse error and three-straight kills to bring the score to 18-8. The set was concluded after three miscues from the Norse. Terrill led the Norse defensively with six digs, followed by Wucherer with four. The Norse offense struggled with their termination during the first set as they had only six kills. Libs and Hardig led the Norse offensively with two kills apiece. The RedHawks took the second set as a result of six unforced attacking errors and four service miscues. The Norse improved offensively after they gained 11 kills and managed to make two solid runs. During that time, Hardig tallied three of her four kills, while Crawford contributed four. Terrill led the Norse defensively with seven digs. With their season on the line, the Norse kept pace with the RedHawks early on (9-9), before the RedHawks gained an 18-13 advantage. The Norse continued to fight, as they had a 4-0 run to close the gap before knotting the score at 20 and 22. The game came to an end after two blocks and a kill from the Redhawks. Libs led the Norse offensenly with four kills, followed closely by Crawford with three. Terrill showed another strong defensive performance and closed the match with nine digs.